A peachy popover to end a peachy day. This is my daughters creation. These are easy enough for her to make an delicious enough to serve to a party of pastry lovers or just our family. Wait those are one in the same! In a bowl mix your peaches, sugar, salt and cinnamon and let sit. 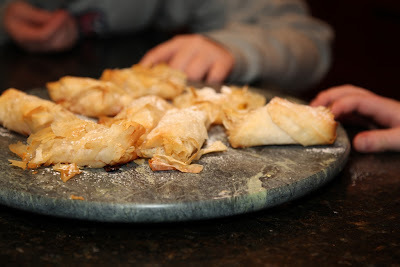 Separate some of the phyllo sheets. 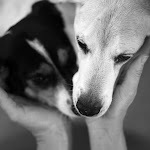 (ours stuck together a little so we were layering 2 -3 sheets at a time , worked fine). 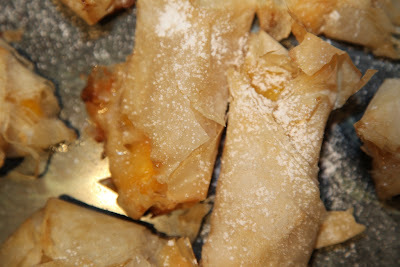 brush the phyllo with the melted butter then add another layer of phyllo and brush again. Cut your sheet into equal squares. Spoon a little of the filling in the center of the square. (we rolled these like a burrito). Roll or fold the dough over the filling trying to seal the filling inside. Brush with butter and place on a cookie sheet lined with parchment paper. Cook at 375 degrees for 18 min or until golden brown. Let cook slightly and sprinkle with powdered sugar. These lool SO good and I just adore cooked peach! Thanks for always sharing your most scrumcious recipes! and i love the puggy looking at me when I comment.